Why is there a shield on my Shutdown button? Once in a while an automatic update runs in the background on your computer and it now needs a shutdown or restart to complete the installation. 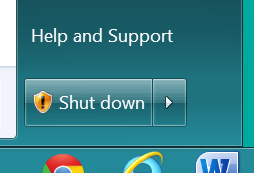 Windows provides this little warning on the Shut down button in the Start menu. You can get a bit more information on this when you move the pointer to the button. This is not an alarm, but do heed the advice and shut down or restart the computer when you take a break. Pat yourself on the back for having set up your machine to perform updates automatically.